And as we’re all painfully aware, that’s exactly what happened. Right around the time sales began to peak, a horrible tragedy suddenly put guns in the spotlight for all the wrong reasons, and all of a sudden those sales numbers either seemed trite in comparison, or were used to reflect what some talking heads deemed a violent, paranoid sect of American culture. A vast majority of young adults under the age of 34 believe that Americans have a right to own an “assault weapon,” according to a new Reason-Rupe poll released Thursday. Republicans and Democrats alike may be surprised at such results, which break with traditionally-held notions that a majority of seniors support the Republican Party, while the youth support the Democratic Party. 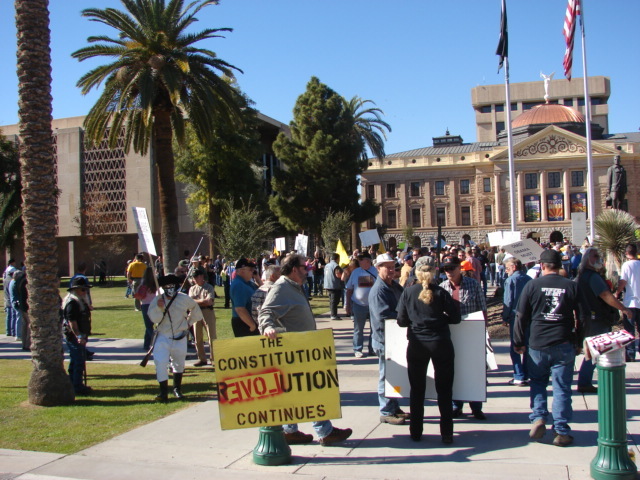 Within days of opening its 51st Legislature, Arizona state lawmakers have begun considering HB 2291–a bill which declares any federal attempt to “ban or restrict ownership of a semi-automatic firearm… unenforceable” in the state. Moreover, the bill also lists as “unenforceable” any federal ban on magazines for such weapons and categorizes any requirement for firearm registration as a non-starter as well. 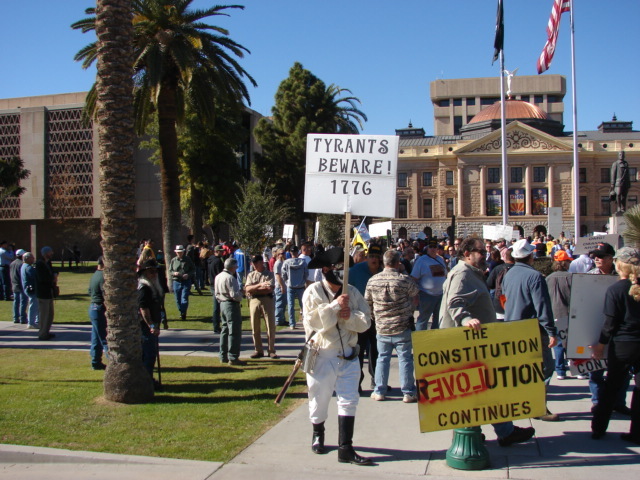 As Wyoming, Texas, and Oklahoma have done, AZ H.B. 2291 threatens felony charges for federal gun grabbers who seek to enforce these measures. One man was killed and another shot in the leg when they, along with three others, allegedly participated in a home invasion Monday evening where the residents fought back. Police said Tuesday that it is still a bit unclear what prompted the five [black] individuals, ages 19 to 23, to force their way into the Victoria Avenue home while brandishing a fake plastic gun. Fairborn Police Sgt. Paul Hicks said the only motive they’ve uncovered was that the subjects intended to rob the home. Two Wright State University students who live at 1006 Victoria Ave. were home when the intruders entered. Trent Seitz, 21, reportedly struggled with the men and was ordered to the floor. He called out for his roommate, Christopher Muse, who told police that he grabbed a gun and fired at the men. Ta’Vaun Fambrough, 19, was shot in the chest. 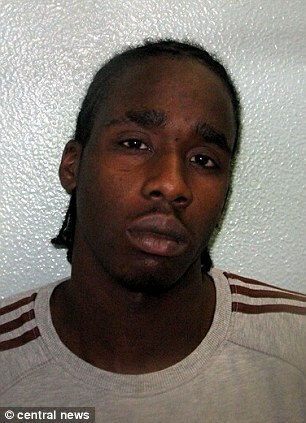 Three of the alleged intruders took off running, including 20-year-old Anthony Barwick II, who had been shot in the leg. When police arrived they found those three individuals around the corner on West Parkwood Drive. Fambrough and another suspect were located at the Victoria address. Fambrough was taken to Miami Valley Hospital where he later died. Twitchy.com has been all over the story of NBC’s latest… I was about to say “latest ethical lapse,” but that would imply they have any ethics to begin with. Let’s just call it the latest example of NBC lying so egregiously, even a few other liberal media outlets are calling them out on it. Twitchy deserves our thanks for catching the lie and presenting the truth. MSNBC is reviewing its portrayal of the testimony of Neil Heslin, the father of a Sandy Hook victim, at a legislative hearing in Hartford on Monday. The 33-second video clip in question… features a graphics box saying “Mocked and Loaded. Sandy Hook Victim’s Father Heckled by Gun Rights Advocates.” “We’re reviewing the video in question,” says an MSNBC source. Smart move, considering that Heslin wasn’t, in fact, heckled. Audience members merely answered a challenge that Heslin posed from the microphone. Which isn’t stopping “news” outlets like BuzzFeed and HuffPo from continuing to spread the heckling story, because it confirms their biases. It’s too good to check. So now MSNBC will “review” it, and in a few days they’ll put out a press release saying they’ve taken measures to ensure it won’t happen again, and that’ll be it. If somebody gets fired over it, they won’t tell us who. It’ll be just like their completely opaque response to the deceptively edited George Zimmerman 911 call. And they’ll continue to do this kind of crap, because they have no incentive to stop. The left will continue to spread lies and disinformation, and it’ll be passed along by willing dupes who can’t or won’t look past their ignorance and lazy prejudices. All we can do to fight this is tell the truth. Push back. Every day. By James Simpson, February 2013 (PDF here)Gun-Control-Issue2 Capital Research Center Foundation Watch The massacre at Sandy Hook elementary school in Newtown, Connecticut, this past December hit home like few other tragedies. Yet again a lunatic commits mass murder, this time slaughtering our most vulnerable and most cherished: our children. Words cannot express the bottomless grief one feels at the mere thought of such loss. Sandy Hook rightfully shook our sensibilities and forced us to reassess what we believe about ourselves and America. Why is this happening? we ask. Bonus: Trotter sent progressives into a pearl-clutching tizzy. (WASHINGTON) -- Gayle Trotter, a tax attorney and only woman on a five-member panel at a gun violence hearing in the Senate Wednesday afternoon, argued women need guns to physically defend themselves from larger, stronger male criminals. Tangipahoa Parish Deputies were called to a home in the 23000 block of Highway 22 east in Ponchatoula, LA after the homeowner reported he had the aggravated burglary suspect at gunpoint. According to the homeowner, the aggravated burglar, 20-year-old Richard Falcon Stewart Jr., was wearing the homeowners clothing and had several of the homeowner's firearms in tote. According to deputies, the homeowner had Stewart at gunpoint when he told the homeowner that he was not going back to jail. That is when Stewart drew a pistol from his jacket and shot at the homeowner. The homeowner returned fire and shot Stewart in the buttocks. Stewart then ran into the wooded area. LAS VEGAS (Las Vegas Sun) — A suspect in the attempted robbery of Huntington’s Jewelry was arrested after he went to a hospital to seek treatment for multiple gunshot wounds. He was identified by Metro Police Friday as Antwjan McClelland. Around 4:50 p.m. on Thursday, McClelland and another suspect went into the jewelry store located at 7385 W. Sahara Ave. near Tenaya Way, Metro Police said, and demanded cash from the cash register. McClelland, who police said was wielding a gun, was shot multiple times in the arm by an employee and the suspect returned fire. That’s when the two suspects fled. A decision on whether or not members of a New Mexico gun dealer family will get a new trial on charges of lying on federal firearm purchase forms could happen as early as this week, Las Cruces Sun-News reported yesterday. Judge Robert C. Brack of the United States District Court for the District of New Mexico indicated in yesterday’s hearing that he will make his decision “soon” following a day of testimony that revealed the extent of corruption a key law enforcement witness against the Reese family was under investigation for – a fact the prosecution withheld from the defense and the jury when it was asked to decide whose testimony during the trial was credible. Defendants Rick and Terri Reese and son Ryin, New Mexico gun dealers jailed for allegedly knowingly selling guns to cartel members, and who have since had conspiracy and money laundering charges against them dismissed, filed a motion for a new trial after being convicted of, as Jeff Knox of the Firearms Coalition described it, “the comparatively minor charge of lying on gun sales forms -- even though the lies they were convicted of were perpetrated by federal agents and the Reese's crimes were that they ‘should have known’ that the agents were lying.” A second son, Remington Reese, was cleared of all charges. The extent of the alleged official corruption might also explain why the prosecution was so anxious to violate established Department of Justice policy when it asked to have yesterday’s hearing sealed from the public, a motion denied by Judge Brack. And those allegations are nothing short of stunning, as Tea Party Patriots of Luna County have documented in an exhaustive five-part detailing of yesterday’s proceedings, information now made public that would not have been possible had the government prevailed, and even now only available because passionately interested chroniclers other than "Authorized Journalists" were there to record and report it. In Part One, the TPP documents how allegations of drug smuggling, ripping off drug dealers, human trafficking and other crimes by the witness (and others) were being investigated, and that this was withheld from the defense and the jury, in violation of Justice Department policy, training, and the law. Mercer County, New Jersey has spent about $324,000 to pay people to turn in firearms on the 24th and 25th of January. 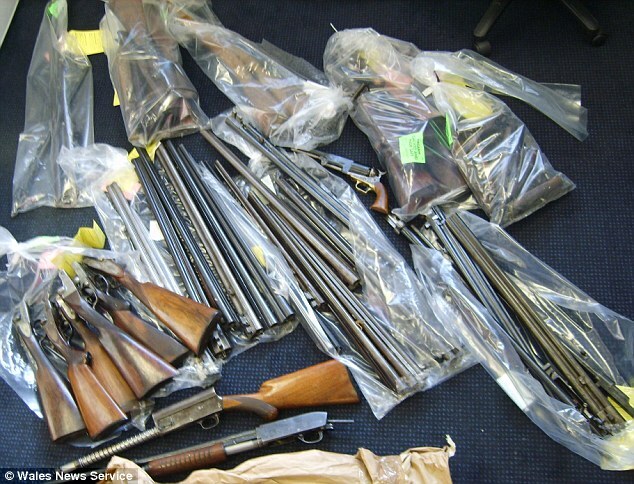 The turn in was a "no questions asked" event that brought in over 2,600 guns, mostly hunting rifles and shotguns, with a few rarities and guns illegal in New Jersey. Sales of guns are highly regulated in New Jersey which has some of the most restrictive gun laws in the country. Private sales of handguns are forbidden, with a separate permit required for each handgun purchased. Purchasers of rifles and shotguns must have a New Jersey FID card and must provide the seller with a written form assuring them that the FID holder is eligible to buy the gun. There were no reports of private sellers paying market rates for the guns that were turned in. The term "buy back" is emotionally charged and irrational. The guns in question were never owned by the people "buying them back" in the first place. Turn in is a more logical description. A gun buy back program is just that, a gun purchase. The purchase of firearms in New Jersey is strictly prohibited except for licensed dealers and individuals with a handgun purchase permit or firearms ID card. All gun sales are recorded and include the name and address of the seller. Unless there is a federal firearms licensed dealer making purchases with forfeited criminal money, this program is not authorized and illegal under the statute to purchase firearms. The payment of cash for firearms by anyone other than a licensed dealer or a permit/ID cardholder is a crime. N.J.S.A § 2C:58-3(a) and (b). Well I guess when NBC News’ David Gregory nor any employee of the broadcast network were charged for violating the DC city’s gun laws on-air TV. It seems that if your are opposed to firearms, you may violate gun laws. "All animals are equal, but some animals are more equal than others" ~George Orwell." Gun turn in events are political theater designed to make armed citizens appear to be illegitimate, and to make firearms appear to be contraband. Their practical effects are to waste police resources, defraud ignorant gun owners of the market value of their property, and to increase the demand for new guns as they decrease the numbers of used guns on the market. The idea of destroying valuable property as some sort of sacrifice to political correctness is absurd. New London Connecticut will be giving Visa gift cards for firearms in March. $100 cards will be given for handguns, $75 for rifles and shotguns, and $150 for "assault-style" firearms. The program will be conducted on the weekends of March 2nd and 3rd and 9th and 10th. The guns are to be turned in at the New London Truman Street police station. No hours have been given. These programs are widely advertised with the propaganda term "buy back". The term is a lie, because the guns were never owned by the people who are now buying the guns in order to destroy them. These programs are designed for one major function: to make political theater that delegitimizes armed citizens, and the ownership of guns. In a practical sense, they defraud ignorant gun owners of valuable property, waste valuable police resources, destroy valuable assets, and increase the demand for new guns by reducing the supply of used guns. In Connecticut, which has some of the worst gun laws in the country, ordinary citizens cannot legally buy or sell handguns without government permission. Firearms that have been defined by Connecticut law to be "assault weapons" are not allowed to be possessed, bought, or sold. Connecticut still has a shred of freedom, because rifles and shotguns that are not defined by law as "assault weapons" may be bought and sold to and from ordinary citizens, if they are not prohibited from owning guns, and if they reside in Connecticut. Antique firearms, and replicas of firearms made before 1898 do not require permits or licenses if they do not fire commonly available fixed ammunition. This opens an opportunity for the brave activist who wishes to expose the insanity of these turn in events. Activists across the nation have stood in public spaces at these events, offering cash for firearms worth more than the people at the turn in are offering. At some events police have violated the activists rights by harassing them in order to stop them from their protest and legal purchases. I would rate the Connecticut event as high risk for police misconduct, because it is scheduled at a police station, police drove off an activist at a recent event, and Connecticut has an active anti-freedom government. I would attend the event if I lived in Connecticut, but I would want to have a friend or fellow activist with me who could record police interactions so that there would be no dispute about what was said. Not surprisingly, Connecticut is also one of twelve states that require all parties consent to record private conversations. A conversation with a police officer in a public place is not ordinarily considered a private conversation, but police in states that require "all party" consent have arrested people for recording their public actions. The U.S. First Circuit court of appeals has ruled that recording police in public places is a First Amendment right, but Connecticut falls under the Second Circuit. In numerous other states, activists have obtained some nice firearms at bargain prices while exposing the ridiculous assumptions of the "buy back" gun turn in events. Here are some links to recent turn in events where private citizens scored bargains. Nikki Y. McNeil, 33, was trying to leave an Ocala residence Saturday evening when Lamark D. Tucker Sr., 36, her ex-boyfriend -- and father of her three children -- took away both McNeil’s car keys and cell phone, according to a news release from the Marion County Sheriff's Office. McNeil then used spare keys to leave, but as McNeil pulled away, Lamark jumped onto the hood of the car and held on while continually threatening McNeil as she drove nearly ten miles, the release stated. McNeil, deputies said, stopped at least twice asking people for help. More 3D printed magazines coming. The people at Defense Distributed are hard at work creating files to print out popular magazines in standard capacities of 10, 15, 17, 25, 30, 33, and 40 rounds. At least one of the people working on the DefCad site has already printed a floor-plate and magazine body for a Glock pistol. The early Glock magazines were made of plastic, so they are well suited for this process. We will not know how these designs will hold up until they are actually printed and tested. 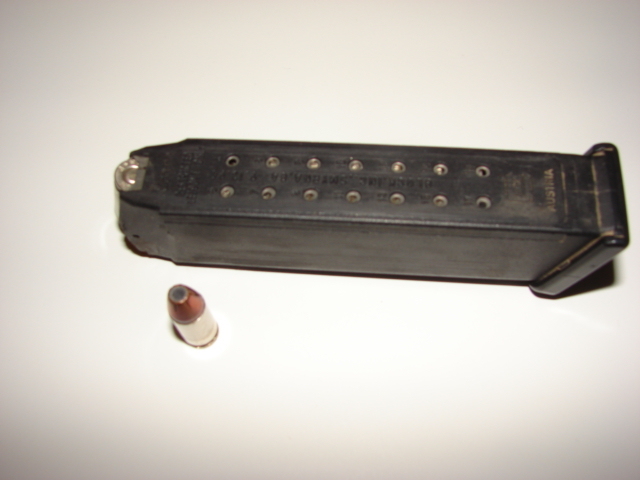 However, 30 round magazines that were prototyped for the KelTec PMR-30 were said to last for 100 to 150 rounds before cracking. Defense Distributed has already prototyped and demonstrated 30 round magazines for the AR15 platform. The 30 round magazine requires an easily obtained steel spring, but the site has files for a 5 round magazine with a printed plastic spring. Glock 17, 19, 26, 34, 17 round and 33 round. AK type 30 round and 40 round. Saiga 12 gauge 10 round. S&W M&P .40 cal. 15 round. The data files to print the magazines are expected to take a few weeks to produce. They will then be made available to the public. Another gun turn in will be conducted at College Park, Georgia on February 9th, from 11 am to 5 pm. The turn in will be conducted at 3631 Main Street. $20,000 of public funds has been allocated for this political theater designed to delegitimize armed citizens, defraud ignorant gun owners, and increase the demand for new firearms by decreasing the supply of used ones. As is happening across the country, private citizens are likely to be on hand to pick up a bargain gun, while offering more than the city will for good quality guns. Others will be scouring their closets and gun safes for the least valuable guns they have, to trade them in for $100 cash. Even inoperable guns will be worth $25 cash. Some wags have suggested constructing $2 zip guns to show the futility of this political theater. In this time of tight fiscal constraints, it is bizarre for the city to use city money for political propaganda. "John Laigaie III of Bellingham, a retired Army master sergeant, lays out the revolvers and rifles he and two other friends purchased on the periphery of the Seattle Police Department's gun buy back event in Downtown Seattle, Saturday January 26, 2013. Laigaie and his friends are advocates of gun rights, and affiliated with the website opencarry.org. They spent approximately $500 on the lot, which they estimate to have a value of near $2,000. Many independent gun buyers and sellers on the periphery of the official buy back were helped by long wait times and Seattle Police closing the line to the buy back hours early after running out of Amazon gift cards to exchange for firearms." I am sure that the firearms sellers were happy to get cash instead of a gift card. The term "buy back" is pure Marxist propaganda, as the firearms were never owned by the government in the first place. These turn ins are purely political theater, designed to delegitimize armed citizens. Their real effects are to defraud ignorant citizens of valuable property, waste police resources, destroy valuable assets, and increase the demand for new guns by decreasing the supply of old ones. As the war on gun ownership widens, two more sheriffs have said that they will not enforce any law, or executive order that they deem unconstitutional. However, he is not alone in his feelings about new gun laws and executive orders. Another sheriff in the great Southwest United States feels the same way. That means Sheriff Babeu has someone in his corner on that issue. “To justify the closure of a courtroom over the objections of a defendant, ‘the party seeking to close [a public] hearing must advance an overriding interest that is likely to be prejudiced, the closure must be no broader than necessary to protect that interest, the trial court must consider reasonable alternatives to closing the proceeding, and it must make findings adequate to support the closure,’” Judge Robert C. Brack of the United States District Court for the District of New Mexico wrote in Friday’s order. “The Government has not met its burden in light of the Government’s disclosure of the witness’s identity in open court,” Brack continued. “Further, the Court has been told for at least two years that the Government could not seal a hearing and could not agree to seal a hearing as a result of a policy adopted by the Attorney General. “The position of the Government here runs contrary to this policy without an explanation,” the judge determined. “The Court is all the more disinclined to seal the hearing on this basis. “Finally, the Court is skeptical of the Government’s representation that the investigation remains ongoing since the reports date back over a decade,” Brack concluded in an undisguised rebuke to the prosecution. “In that the Government has not made the required showing, the hearing will be open to the public,” he ordered. The order also decided documents would remain sealed for the defendants’ motion to unseal the motion for a new trial. Gun Rights Examiner readers following this case and the family’s ordeal know the family has had assets needed to mount an effective defense seized, and Rick and Ryin have been jailed since their arrest in August of 2011. Wife Terri made bail in late March of 2012 when she was released to a halfway house. Son Remington was acquitted of all charges. Readers here have also learned about conflicting testimony against the family by an ATF agent, puzzling details with a potential Fast and Furious connection, and stunning developments pointing to the prosecution withholding evidence about a key witness while the father and son, already cleared on the most serious charges, were led into Judge Brack’s courtroom shackled like dangerous animals. GARDENA, Calif. (KABC) -- Gardena police say an attempted robbery suspect was shot by his alleged victim on Saturday evening. Police said the suspect approached an off-duty security guard around 6:15 p.m. in the 2000 block of Rosecrans Avenue while simulating a handgun and demanding property from the victim. Investigators said the victim feared for his life. He shot the suspect once in the stomach. A suspected burglar was held at gunpoint by a homeowner before being taken into custody by police. Officers said that 22-year-old Jean Carlos Rivera-Gonzalez broke into a home on the 300 block of Mill Street in Lancaster earlier this week. The husband told Rivas to let his wife go or he would shoot him. Rivas refused and that is when he shot him in the leg, Kleine said. The homeowner told investigators he felt him and his wife's safety were threatened, so he shot him a second time in the chest. A suspect who was shot by a McLoud homeowner during a reported overnight burglary remained hospitalized Friday. McLoud Police Major Carol Pendley said the shooting incident occurred about 4:18 a.m. Thursday morning at a home on the city’s south side after the homeowner awoke to find a burglar coming through a door of his home. A Lufkin man charged with unlawful possession of a firearm in a Wednesday afternoon point-blank shootout was defending himself, according to an Angelina County investigator. Unlike Benjamin Bogany, 30, and Destini Williams, 23, who were both in another vehicle, Andrew Netherton, 30, has not been charged with aggravated assaulted with a deadly weapon following the Wednesday afternoon incident on Winston 8 Ranch Road near Hammer Equipment off Highway 59 north. A reader, John, took the trouble to post the following comments, so I will take the trouble to post a reply. Johns comments are numbered and lettered. My reply will be below Johns comments and not numbered or lettered. 1. Gun control does not mean gun bans. No one is coming to take your gun so please keep your paranoid fantasies out of this. One counterexample disproves this argument. I have several. Canada, May, 2010. The RCMP confiscated firearms that were formerly legal. Australia, 1996. Owners of Semi-automatic rifles and shotguns are required to turn them in. UK, 1996 total handgun ban. New York Gun ban, 1991. 2. The guvamint isn't out to get you. You are most likely so insignificant to them you aren't even on any radar. In a way, John has a point. The purpose of all these anti-rights laws are to make firearms ownership more difficult and rare, until the American gun culture is small and politically irrelevant. It is a form of cultural genocide. To do this, you do not have to prosecute most gun owners, not even a sizable minority. You only need to make examples of a few to get the rest to fall in line, or to gradually delegitimize the ownership of guns until grandchildren gladly turn in grandfather's shotgun. That is what was done in the UK. Of course, that does not help the people that are made examples of, such as Randy Weaver at Ruby Ridge, or the Reese family in New Mexico. 3. The second amendment is NOT absolute, see 2008 DC vs Heller. Just like the first amendment, it has restrictions. Correct. You do not have the right to shout “Fire!” in a crowded theater, when there is no fire. Nor do you have the right to fire a gun in a crowded theater when there is no justification to do so. No one is claiming the right to unjustifiably fire in a crowded theater. No one is claiming a right to have nuclear weapons without tight government controls. The anti-rights people are trying to impose onerous restrictions on the most Constitutional of arms, those of most use to a militia, semi-automatic rifles. As those firearms are also the least used in crime, it is hard to see any utility in their arguments. 4. If you are against gun control, you are against background checks and for selling guns to criminals. Those are forms of gun control already in place. I am against background checks. It is already illegal to sell guns to criminals. Background checks have proved to be a failed paradigm and should be repealed. They have proved to be ineffective. There is no point in putting burdensome restrictions on the 99 percent of the population that is no threat in order to ineffectively attempt to prevent the 1 percent that is dangerous from acquiring a gun. They are simply a cover to gradually implement registration which is equivalent to confiscation. If the resources spent on background checks on the many were spent on prosecuting the few who should legitimately be barred from possession of guns, it would be much more effective. This has been shown to be true in several cases. See project Exile. 5. If the constitution is sacred and can never be changed, do you think women should not have been given the right to vote? Or African Americans equal rights? That was amended in the constitution. As John notes, there is a method to amend the Constitution. The anti-rights forces know that they cannot repeal the Second Amendment through this legitimate process, so they resort to trying to redefine words to eliminate the Second Amendment through fraud. John is welcome to work at repealing the Second Amendment. There is a known process. It has been successfully used several times. What that has to do with this debate is unknown, but John seems to think it relevant. 6. Just because a form of control isn't perfect does not mean it is completely useless. True. By the same token, just because a form of control might do some good does not mean that it will not do great harm. 7. PLEASE, and i mean PLEASE stop comparing guns to other things that cause fatalities (cars, ladders, medical malpractices). a. Because cars have many many regulations and because of this we have limited the amount of car fatalities over the years. Same with ladders, same with medical malpractice. All of those things have a history of regulation, laws passed to help prevent deaths. Cars and ladders are not specifically constitutionally protected. Nor are there powerful political forces pushing to outlaw them. Guns are more highly regulated than cars and ladders in many ways, and have become considerably safer by private industry standards without government safety regulation. The fatal firearm accident rate today has been reduced by 94 percent since 1905.
b. Guns have only one function, to kill or damage. By removing/restricting them you don't lose a lot. Remove cars and see how you do. Remove doctors and see how you do. Completely false. The major function of guns is to deter the use of force. They do this very well. Many studies show between 2.5 million and 400,000 uses of private firearms a year to prevent crime, the vast majority of which occur without firing a shot, in the United States. Most police officers go an entire career without firing a shot but most find their guns very useful. If the only function of guns was to kill or damage, then the 300 million plus guns in the United States are doing a terrible job. Killing is sometimes required and necessary, and when it is, one desires the best instrument for the job. Guns also serve as a deterrent to runaway governments. The mere presence of hundreds of millions of guns gives pause to would be dictators. Hundreds of millions of people were killed by their own governments in the twentieth century by democide. Guns are very commonly used for less exciting purposes, such as subsistence hunting, pest control, and many varieties of sport. John may not own guns, therefore it is easy for him to believe that you do not lose much by removing or restricting guns, but tens of millions of Americans disagree with him. It is very easy to give up something that you consider of no value. I respect John's use of the First Amendment, and will defend to the death his ability to make what I consider dangerous arguments. Why is he not willing to disagree about my choice to have and own guns, but be willing to defend it? Ideas are far more dangerous than rifles. And finally, why is it that ANY other source of fatalities are subject to be made safer but for some reason, guns are completely exempt from this logic. No one cares about the 10+k homocides each year, or the 30K total gun fatalities. The above statement is simply false. There have been tremendous improvements in gun safety over the last 100 years. The homicide rate has fallen in half in the last 20 years. Suicides are simply not a “gun problem” because so many other methods can be substituted. It always puzzles me than many people believe that it is alright for someone to commit suicide with a doctor, but not with a gun. Homicides in this country are not a gun problem. They are a cultural problem. Gun control is simply a convenient scapegoat for those who do not wish to face the cultural problems. The coverage of two recent events in the District of Columbia shows how the old media in this country has dropped all pretence of impartiality. The first image is from yesterday, 25 January, in Washington, D.C. Please consider how much media coverage you have heard about it. It was a pro-life protest. The second image is from the next day, today, the 26th of January. Consider how much media coverage that you have heard of this event. The camera shots are completely different. The first gives you a pretty good idea of the size of the crowd. The first image is from the new media. The second shot does not give you a good idea of the overall size of the crowd. The image is from AP. This is very deliberate. 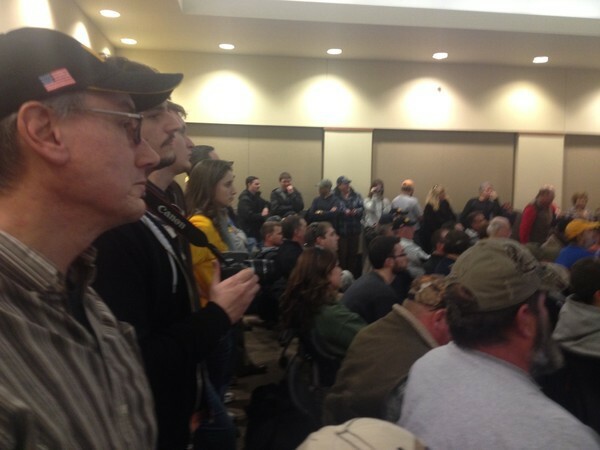 I could not find any shots of the overall crowd of the second event. By my memory, both events were described as having "thousands of protesters". 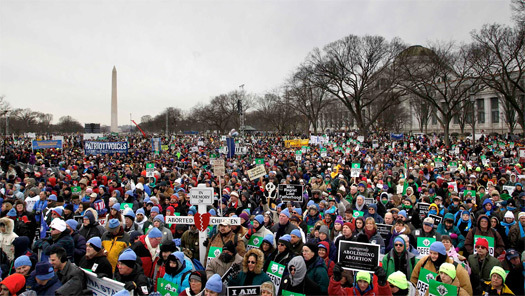 Many outlets did not even mention the pro-life event. I used the pro-life image because it was only one day apart from the anti-rights image, and because the pro-life cause is every bit as politically incorrect as the right to keep and bear arms. The old media has become so self blinded and self deluded by progressive political correctness that it has become a tool of repression for the regime. GARY | A 19-year-old carjacking suspect was shot by the vehicle's owner Thursday while he allegedly attempted to steal a car in the 3700 block of Connecticut Street, Gary police said. Police said the 19-year-old reached inside his coat, and the car owner shot the suspect. This is a followup to the home defense shooting on 13 January. The homeowner shot and killed Robertson, so the accompices can be charged with felony murder. The Montgomery Police Department has arrested two teenagers in connection with the Jan. 13, 2013, shooting death of 20-year-old Deandre Robertson of Montgomery. MPD detectives charged Orlando Bowen, 17, and Keyon Butler, 19, both of Montgomery with one count each of felony murder and first-degree robbery. Both suspects were taken into custody Wednesday. Both are being held at the Montgomery County Detention Facility under bonds totaling $135,000. A secret arsenal of guns and ammunition hidden in the wake of the Dunblane massacre have been found stashed behind a false wall by a builder renovating a house. Builder Simon Berni, 41, was shocked to discover a secret haul of more than 30 shotguns and pistols as well as hundreds of rounds of ammunition when he began working on a south Wales property. The guns were wrapped in newspaper dated March 1996 - just days after the Dunblane massacre in which 16 children were shot dead. Police believe the guns were unregistered and their owner hid them out of fear of losing them when strict new firearms laws were brought in following the Dunblane shootings. This is the result that President Obama and the "Progressives" want. They do not want to go door to door confiscating guns. They just want to make them illegal so that 40 years from now, when your nephew finds them, he will be "shocked" and will dutifully turn them in to police; terrified that he might somehow be held responsible for their presence. It is not the guns they hate. 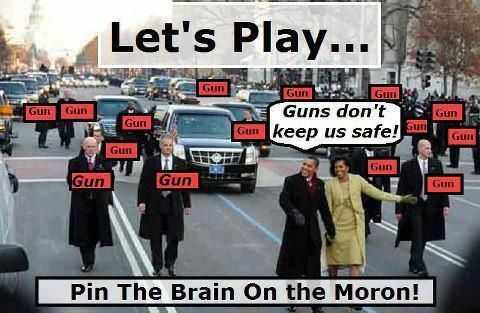 They enjoy having people under their personal direction, such as their personal bodyguards, or if politicians, police and military that they direct, having lots of guns. They just do not want *you* to have them. They "only" want them to be illegal so that they can gradually destroy the Gun Culture and the spirit of independence that it supports. They hate and detest the idea that the government serves at your pleasure, and not you at their pleasure. That is what civilian disarmament is all about. A gang [above] of elite British Army soldiers who smuggled drugs and guns into the UK have been jailed for a combined total of almost 50 years today. 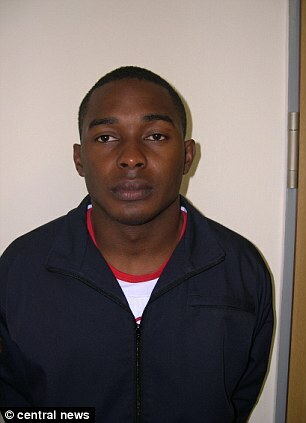 Trooper Lemar Loveless, 26, masterminded the operation to bring a cache of guns, ammunition and £70,000 worth of cocaine through the Channel Tunnel loaded into the back of BMWs. He had discharged himself from the Queen's Royal Hussars, the most senior light cavalry regiment of the British Army, just days before his arrest. 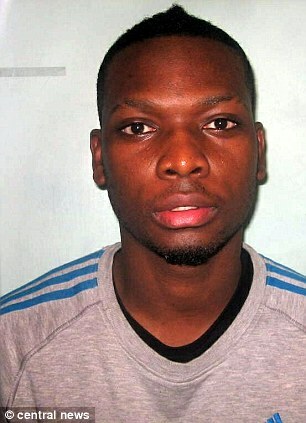 Loveless was caught out by immigration officials in Folkestone along with regimental colleague Trave Dyce, 22. The pair had five guns, including two Walther PPKs favoured by fictional spy James Bond, along with three silencers, ammunition, and half a kilo of cocaine, Woolwich Crown Court heard today. The court heard the operation was well-planned and included wrapping the illegal stash in curry powder lined tape to try to evade detection by sniffer dogs. TRINITY COUNTY, TX (KTRE) - Officials with the Trinity County Sheriff's Office believe that an armed neighbor prevented a violent confrontation between an armed convicted felon and a woman from the Glendale community from escalating into something much more serious Tuesday. The threatened individual armed himself with a 9mm, and called 911. The aggressive neighbor, who was armed with a .243 rifle, backed off. Sheriff deputies arrived and arrested the man. COUNTRY CLUB HILLS • A man shot and wounded Thursday morning by a supermarket clerk during a robbery attempt was charged today in the crime, police said. Adam Willoughby, 20, of the 5700 block of Beldon Drive in Flordell Hills, was charged with attempted robbery. Police said he was in critical condition at Barnes-Jewish Hospital from gunshot wounds. Police say a clerk at Mally Supermarket at 7445 West Florissant Avenue shot and wounded Willoughby when he tried to rob the store just before 6:30 a.m.
Ramona Taylor Kamate is one brave woman who says, she's tired of being a victim. The 56-year-old grandmother and great grandmother from Clinton Township has a permit to carry a gun, and when she was attacked on a city bus, she used it. It's a bus route Kamate is quite familiar with, she's also grown accustomed to seeing some of the same people who take the bus with her. Police said people inside of a Garfield home may have acted in self-defense when they shot an intruder Wednesday night. Investigators said they were called to the home on Browns Way around 6 p.m.
Police said a masked man tried to force his way into the home by firing shots through the front door. Investigators said one man inside of the home was shot in the face. According to police, another man inside of the house grabbed a gun and fired shots at the intruder, Michael Andrews, of East Hills. The second victim was also shot, police said. 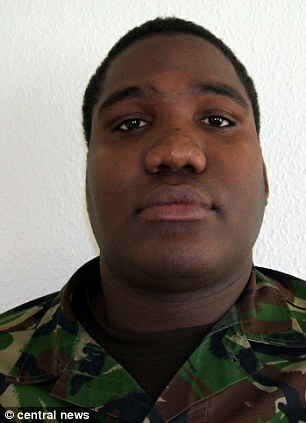 Andrews, 27, later died at an area hospital. The Transylvania County Sheriff's Office says the intruder entered an outbuilding and came face-to-face with the homeowner. Deputies say the man had a machete and told the homeowner to give him money. The homeowner pulled out a .22 pistol and shot the intruder with ratshot. Authorities say a father acted in self-defense Monday night when he fired one shot, striking his 26-year-old son in the stomach. The incident occurred in the 2800 block of South Pasfield Street shortly before 6 p.m. Sergeant Jim Tapscott of the Sangamon County Sheriff’s Office said the son showed up at his father’s home intoxicated. He went to the back door of the home and reportedly began yelling obscenities and trying to force his way in. WTXF-TV reported. When she went to throw it out in class the next day, another student spotted it and called her out. A school administrator was summoned, and Melody was reprimanded for having the paper. Melody’s mother, Dianna Kelly, is furious and has been keeping her daughter out of class to avoid harassment. She said she wants to pull her out of the school permanently. “Why did he threaten my daughter? Why did you stand over my daughter and tell her that you should call the cops on her? ‘You can be arrested?’ Why were you trying to scare her?” Kelly said. School officials did not return a request for comment from WTXF. The Philadelphia school district said it was looking into the matter. The Eastern Sports and Outdoors Show (ESS) is one of the biggest in the world. It is (or was) held in Pennsylvania, and had upward of 200,000 attendees each year. On January 18th, word was received that the management of ESS decided to change the show rules at (for major shows) the last minute. They decided the political climate was right to prohibit Modern Sporting Rifles (MSRs) from the show. The response was immediate and massive, amplified by overwhelming grassroots support. Vendors bailed, even if it cost them thousands, in protest of this blatant politicization of the show. Cabela's, one of the main sponsors, bailed almost immediately. The spontaneous boycott snowballed. By yesterday a quarter of vendors and celebrities had bailed, and more were announcing by the hour. Reed Exhibitions' response was curious. They could have ended the boycott and saved the show very quickly by announcing that the decision was a local mistake, or a misunderstanding. They chose to do neither, promising a statement from day to day, while not delivering one, as the boycott gained momentum and grew gigantic. Finally, a statement was released today, saying that the show was "postponed". In practice, for a major show, this means "canceled". “Our original decision not to include certain products in the Eastern Sports and Outdoor Show this year was made in order to preserve the event’s historical focus on the hunting and fishing traditions enjoyed by American families. In the current climate, we felt that the presence of MSRs would distract from the theme of hunting and fishing, disrupting the broader experience of our guests. This was intended simply as a product decision, of the type event organizers need to make every day. “It has become very clear to us after speaking with our customers that the event could not be held because the atmosphere of this year’s show would not be conducive to an event that is designed to provide family enjoyment. It is unfortunate that in the current emotionally charged atmosphere this celebratory event has become overshadowed by a decision that directly affected a small percentage of more than 1,000 exhibits showcasing products and services for those interested in hunting and fishing. In effect, Reed Exhibitions would rather cancel the show than return to the status quo that existed before they made their inflammatory and political decision. It appears that supporting the Obama regime's politics was more important to them than making money. They are a large organization based in Europe. They manage over 400 shows a year, of which only 32 are in the United States. They appear to be on the "progressive" end of the political spectrum. While lesbian, gay, bisexual, and transgender (LGBT) people often support armed self defence (Pink Pistols), separating them as a subgroup to be targeted for marketing is not indicative of a conservative organization. Reed Exibitions' issue of a press release on January 8th did just that. Reed Exhibitions parent company, Reed Elsevier, announced that they would be exiting the Defense Exhibition business during the second half of 2007. It remains to be seen if Reed Exhibitions will be retained by the National Shooting Sports Foundation to manage the Shot Show next year, as they did just two weeks ago. I find the lack of media coverage amazing. We have everything necessary for a great news story. British company dabbles in American politics, perhaps trying to curry favor with the administration. American grass roots response by boycott is immediate and massive. A huge show, with over 200,000 attendees is shut down because the Brits will not back down. This in the middle (likely because of) some of the most hotly contested political issues in years. Not a peep from the old media. Why is this not covered in the New York Times, ABC, NBC, CBS, NPR? A cynical person would say that it is not covered because it hurts the Obama regimes' political agenda. The only Utah Sheriff missing is Jim Winder of Salt Lake County. We, the elected sheriffs of Utah, like so many of our fellow Americans, are literally heartbroken for the loved ones of the murdered victims in Connecticut. As Utahans, we are not strangers to this kind of carnage – one of the latest being the 2007 Trolley Square murders wherein nine innocents were gunned down – five losing their lives. We respect the Office of the President of the United States of America. But, make no mistake, as the duly-elected sheriffs of our respective counties, we will enforce the rights guaranteed to our citizens by the Constitution. No federal official will be permitted to descend upon our constituents and take from them what the Bill of Rights-in particular Amendment II-has given them. We, like you, swore a solemn oath to protect and defend the Constitution of the United States, and we are prepared to trade our lives for the preservation of its traditional interpretation. 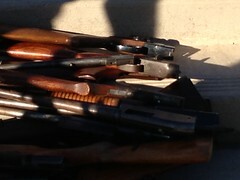 HEBER CITY Utah (ABC 4 News) - Utah's sheriffs are prepared to take on the president when it comes to guns. Last week they sent him a letter stating they would not enforce any new gun laws they believe are unconstitional. "We are prepared to trade our lives in defense of the constitution of the United States," says Summit County Sheriff David Edmunds. 28 of Utah's 29 sheriffs signed off on the letter. Edmunds says it's meant as a preemptive strike in case the president enacts tougher gun laws like limiting assault rifles or restricting the amount of ammo in a gun clip. " (WASHINGTON) — In the midst of the gun debate, a state senator from Maine proposed a bill that would allow teachers and other school employees to carry concealed weapons on the job. HOLLYWOOD (CBS4) – An attempted robbery turned into a shootout at a Hollywood gas station. In the end, one robbery suspect was killed by the clerk, a second was arrested. 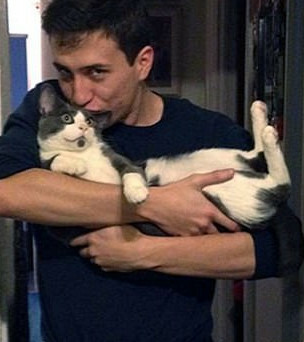 It could have ended very differently if Hasib Kuric, who is homeless, hadn’t intervened. Kuric was standing outside the UHaul truck he calls home behind the Exxon gas station, at 5190 South State Road 7, around midnight when he saw two men with weapons putting on masks. 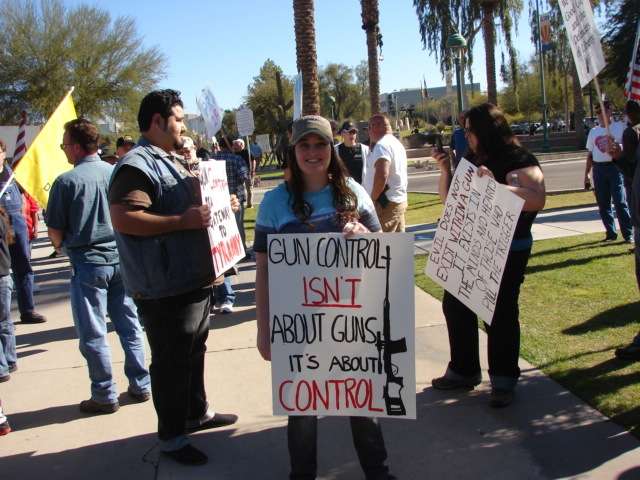 (GunsSaveLife.com) – Gun control advocates were elated in the days following the Newtown, Connecticut school massacre. They were elated not that children were slaughtered by an evil man-child as part of an insane rampage, but because in the hysteria following the tragedy, Americans were demanding our leaders to do “something” to prevent insane rampages by lunatics as part of their grief. There are five stages of grief and they are denial, anger, bargaining, depression and acceptance. In the days following the Connecticut massacre, Americans were in the anger and bargaining stage of grief, and gun control advocates were right there to tout their freedom- and liberty-killing snake oil as the solution. Freedom was on the ropes and it looked rough for America’s responsible, freedom-loving gun owners who were being blamed for an insane scumbag’s unlawful rampage. Well, the grieving process is winding down for America as a whole and earlier irrational and hysteria-driven clamoring for gun restrictions on innocent Americans is evaporating faster than a freon spill on a hot summer day. Now gun control advocates are grieving over their overall failure to push through gun bans and gun restrictions while riding a wave of irrational hysteria. Leftist gun haters are in denial that Americans, absent hysteria, recognize that gun bans aren’t best for their personal security and well-being, and that the only thing that stops evil men is good people with guns. Gun control proponents are angry that America has moved on to discussing President Obama’s inauguration, the next “fiscal crisis” in Washington, Roe v. Wade’s anniversary and so forth. Police say an 82-year-old Ellsinore man shot a man who reportedly broke into his home Friday night. It happened shortly after 7:30 p.m. on North Herren Street. According to Carter County Sheriff Richard Stephens, Charles L. White, 30, of Ellsinore, broke into the residence and assaulted the 82-year-old. White reported fled after being shot. WEST CARROLLTON, Ohio (WDTN) - West Carrollton Police cleared the scene at Upland Drive just before 10 Saturday night. Neighbors tell 2 News they heard shots fired on Skyview Drive, which is a street over, just before 7 P.M. They say they saw a man fall into the street, bleeding, then he took off. BRADENTON - An armed suspect attempting to commit a robbery was shot dead by the victim in Bradenton Sunday night. Oklahoma City police said five people were trying to burglarize a home at the 1500 block of SE 45 when the female homeowner shot one of them, and her friend shot another one. SAN ANTONIO - A scary situation for a family on the Northeast Side. Just before 10 am Sunday morning Bexar County Sheriff's Deputies say someone tried to kick-in the front door at a home on Sunlit Trail. We're told the mom called 911 and the son fired one shot through the door. The suspect then took off after firing his gun. SACRAMENTO (CBS13)- A man shot and killed another man who chased him around his yard and threatened to hurt him. At around 3:30 p.m. Sunday, a resident was opening the gate to his driveway on the 3100 block of Palmer Avenue and was getting ready to drive somewhere with his wife, when a man walked up and started acting irrationally. Russia’s (legal) gun ownership rate is a rock-bottom 4,000 per 100,000 citizens and the country has a murder rate exceeding 15; Norway’s gun ownership rate is 30,000 per 100,000 and the murder rate is below 1. A schoolgirl was in hospital last night after being shot while watching TV on the sofa with her mother. Davina Adarkwa, 11, was caught in a hail of bullets when gunmen opened fire from as little as three metres away through the window of her home. The promising student and her mother, Abena Adofo, 48, were both injured as up to 10 rounds were blasted into their living room. Detectives said it was a miracle no-one was killed as the window was obscured with blinds and the hooded gunmen could not see who was inside. 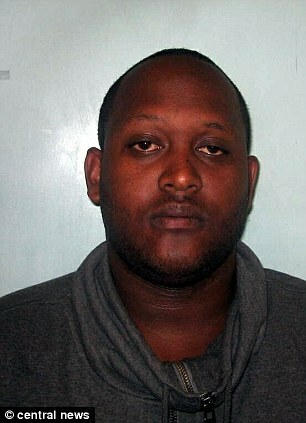 The shocking attack took place in a tightly-packed road of 12 houses shortly before 10pm on Sunday evening. Three black men were seen running away after the shooting, which police believe may have been a gang-related attack. 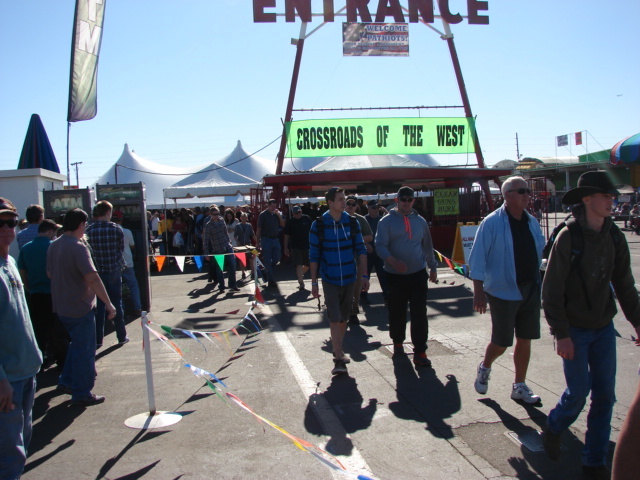 Reed Exhibitions has 32 events scheduled in the United States for 2013, including the world famous Shot Show. The NSSF is the sponsor of the Shot Show and has strongly condemned the actions taken by Reed Exhibitions. "The National Shooting Sports Foundation strongly disagrees with the decision of the Eastern Sports and Outdoor Show’s management to disallow the display and sale of Modern Sporting Rifles at its 2013 exhibition." It is unknown if, given the strong reaction taken to Reed Exhibitions foray into American politics, if the NSSF will retain Reed Exhibitions to run the Shot Show next year. I wonder if Reed Exhibitions has any other managers that are willing to put their clients at financial risk in order to dabble in American politics. Well, congratulations to Citrus County, Florida for providing America with the next Daniel Harless-style video. Harless, of course, was the Canton, Ohio cop who threatened to execute a law-abiding card-carrying good guy for having the audacity to lawfully exercise his right to carry the means with which to protect himself. Harless was eventually canned (links to videos can be found here) and subsequently won his job back if he could pass a medical screening. It was a bad Sunday for sponsors of an meeting to create a grassroots chapter of the Illinois Council Against Handgun Violence at the Glenview, IL Police Station Auditorium failed miserably as supporters of the Constitution and civil rights took part in the event. In the end, unsubstantiated assertions by the gun control advocates were challenged by a boisterous audience. (Glenview Patch) – Gun ownership advocates intentionally packed Sunday’s gun control panel by the New Trier Democrats, as pro-gun advocates — who were encouraged to come from across the state in a mass email from the Illinois State Rifle Association (ISRA) — argued and yelled at panelists throughout the program. The email also encouraged attendees to arrive between an hour and half an hour early, to “ensure that there are more of OUR people there than THEIR people,” according to the email. That resulted in venue at the Glenview Police Station auditorium filling up, with many would-be attendees turned away at the door. While all of the speakers faced outrage and yelling from the crowd — with many being called a “liar” or “loser” as they spoke — none seemed to anger the crowd as much as Lee Goodman, of the Stop Concealed Carry Coalition. Who needs an AR-15? Especially an AR-15 with a 20 or 30 round clip? These are the kinds of questions that have become popular fare by talking heads like CNN's Piers Morgan over the past few weeks. He criticizes "assault weapons" in general and AR-15s in particular--labeling them "killing machines"--and asks guest after guest on his television program, Who needs one? One answer to Morgan's line of questioning is that anyone looking for a home defense weapon or a self-defense weapon may very well need an AR-15 (or an AK-47 or SKS rifle). Ironically, a "Personal Defense Weapons Solicitation" for Department of Homeland Security (DHS) agents in Immigration and Customs Enforcement (ICE), lists an AR-15 variant as "suitable for personal defense." So who needs an AR-15? According to the DHS document, it might simply be those who are looking for "personal defense." I estimated that there were over a thousand people in attendance. I counted 100, then counted roughly equivalent slices. I would estimate that about one third of participants were armed. The gun show a short distance away (competition for the rally) was packed. Arizona Senator Jeff Flake to consider "Universal Background Checks"
Echoing many of his lower-chamber colleagues on Friday, Sen. Jeff Flake, R-Ariz., said he likely would have a hard time supporting a new federal ban on “assault weapons” and high-capacity magazines but suggested there may be common ground on universal background checks. Requiring the 99 percent who are law abiding to jump through hoops in order to try to keep the 1 percent who are dangerous from aquireing firearms has always been a losing proposition. It is a failed paradigm that should be abandoned. It has always been a path meant to end with registration so as to enable confiscation. Jeff Flake has an A rating with the NRA. It is time for his constituents to remind him that they do not need, nor does it serve the public, to suffer further infringements on the Second Amendment with "universal firearms registration" I mean "universal background checks", which are designed to end up at the same place. What does work are projects to make sure that those who are prohibited from having firearms do not have them. That has been tried and does work. Limited resources should be applied to that effort, not the irresponsible and ineffective idea of establishing dangerous bureaucracies to check on millions to catch a few irresponsible individuals. Covington VA --(Ammoland.com)- The Senate Courts of Justice committee this week killed or neutralized all but one anti-gun bill. Senator Marsh’s “gun show loophole” bill was heavily modified and ended up requiring that only gun dealers could sell guns at a gun show. After the meeting Senator Stanley indicated that he had misunderstood the full ramifications of the modified bill. The committee reconvened on the Floor of the Senate later in the day and Senator Stanley changed his vote. I heard that an idea was floated by another gun organization that a person wishing to purchase gun at a gun show could only do so after going to some special table, getting a background check done and then present the receipt from a successful background check to any dealer or private seller at the show. Only people with the successful background check receipt would be able to purchase firearms at a gunshow. We oppose any such mandatory scheme for private sales and will fight against such a bill. Now and then you hear someone mention that during the slave era in American history, blacks in the South were worth only three-fifths of a full person. Paradoxically, or perhaps counter-intuitively, it was Southern slave owners who wanted to count black slaves as full people, for the purpose of congressional apportionment (while denying them the vote and most basic human rights). Northern abolitionists wanted blacks not to count at all, in order to deny the South congressional seats, and both sides agreed to a compromise of three-fifths. Regardless of how the fraction was arrived at, the idea of an antebellum slave being worth three-fifths of a full person has stuck. Today in New York, an ordinary citizen is only worth seven-thirtieths of an elite government employee (who is, ironically, still referred to as “a servant of the people”). That is .233 if you do the division. Less than one-quarter; and one-quarter, if your math is rusty, is less than half of three-fifths. How did I arrive at the 7/30 ratio? Because today in New York, the proles are only permitted by their masters to own ammunition magazines with a maximum capacity of seven cartridges. This scant number, while the government elites are guarded by phalanxes of armed bodyguards carrying standard-capacity thirty-round magazines in their own semi-automatic “assault rifles.” Clearly, these elites consider their own lives to be worth four times more than ours. 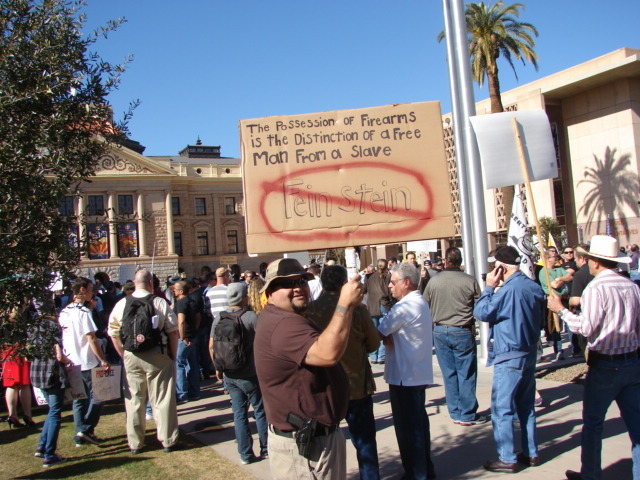 Pictures from the Arizona Rally at the capitol, 19 January, 2013. I estimated over a thousand in attendance. 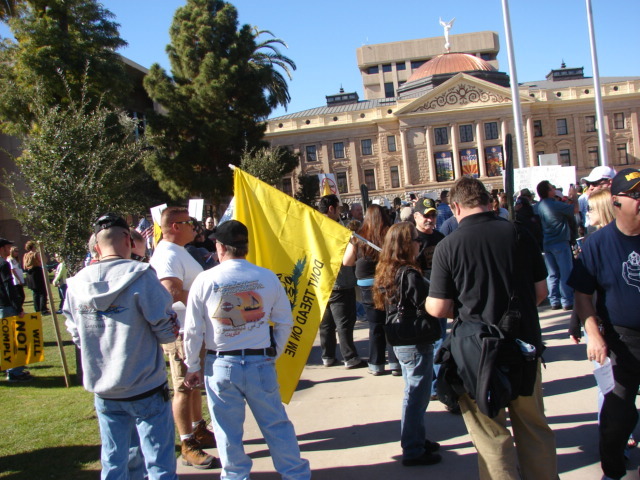 It appeared to me that about one third of the rally attendees were openly armed. The Rally was competing with a gun show at the fairgrounds not far away. The gun show was packed. January 16, 2012 - Houston police are investigating an incident in which an off-duty HPD officer discharged his duty weapon at a male in the 10000 block of Sagetrail about 1:40 a.m. today (Jan. 16). The male fled on foot. It is unknown if he was struck or wounded. The officer who discharged his weapon, G. Parker, was sworn in as an officer in March 1999 and is assigned to the Southeast Patrol Division. He was not injured in the incident. The officer was at his residence when he observed an unknown male walking up his driveway. The male then walked around vehicles parked in the driveway, looking in them and making furtive movements. The extremely suspicious behavior of the male led the officer to believe the male was about to break into his vehicles. The officer retrieved his weapon, exited his residence and gave verbal commands to the suspect. The suspect did not comply and instead began running at the off-duty officer. The officer could not see the suspect's hands as they were concealed in his pockets. Fearing the suspect had a weapon, and seeing the suspect charge at him, the officer discharged his weapon multiple times at the suspect, who fled on foot. As is customary in HPD officer-involved shooting incidents in the city limits, the case is being investigated by the HPD Homicide and Internal Affairs Divisions. Anyone with any information on the suspect in this incident is urged to call the HPD Homicide Division at 713-308-3600 or Crime Stoppers at 713-222-TIPS. PENDLETON — A man who shot an intruder in his Pendleton home Saturday night will not be charged by the Anderson County Sheriff's Office. James Crawford acted in self-defense when he shot Kevin Powers, 39, in the leg when he entered Crawford's home, said Chad McBride, spokesman for the Anderson County Sheriff's Office. A homeowner in Powelton shot a man who broke into his house to death Tuesday night, police said. Cops said the man was upstairs in his home, on Wiota Street near Spring Garden, around 9 p.m. when he heard the burglar break into the house through his kitchen door. The burglar made it to the living room, with a spade shovel in hand, and started up the stairs to the second floor when police say the 37-year-old homeowner shot him three times in the chest. The burglar was pronounced dead at the scene, police said. POTTAWATTOMIE PARK — The two burglary suspects who were shot during a home break-in Friday night remain in stable condition at an undisclosed hospital, according to Tim Richardson, who serves as Michigan City Police’s chief of operations and Pottawattomie Park Police’s deputy marshal. Neither suspect has been formally charged, but a police officer is stationed at the hospital to detain them if they are released. Richardson said he expects prosecutors to file official charges and a judge to issue arrest warrants during a probable cause hearing scheduled for sometime Monday. He said he cannot release the suspects’ names or any other information until after that hearing.